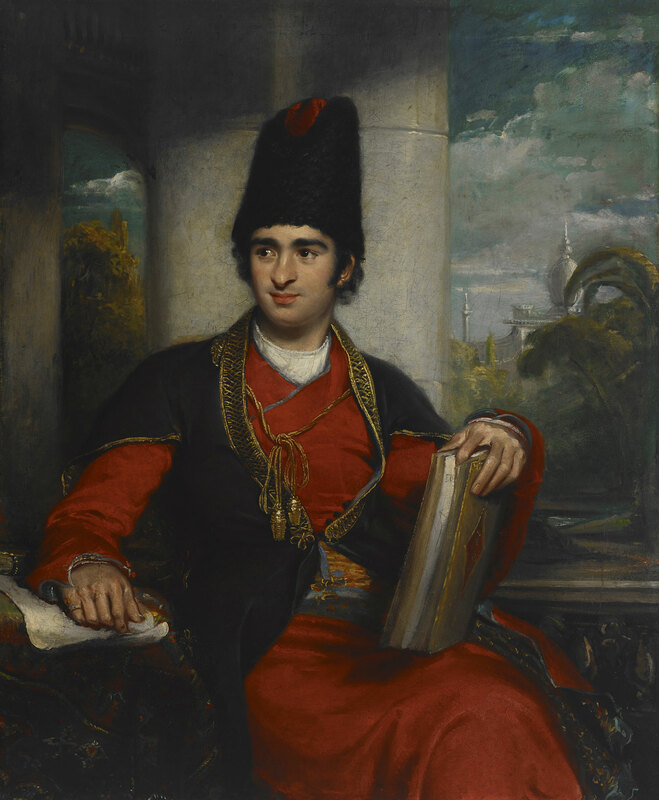 Avery Architectural & Fine Arts Library is pleased to announce the opening of a new exhibition, “Looking East: James Justinian Morier and Nineteenth-Century Persia,” in the Wallach Study Center. This exhibition is the second in a new series called “MA in Art History Presents,” in which the MA students, under the guidance of Dr. Frederique Baumgartner (director of the MA program, Dept. of Art History and Archaeology) and Dr. Roberto C. Ferrari (curator of Art Properties), curate an exhibition drawn from Art Properties and other related Columbia Libraries holdings. The online exhibition can be viewed by going to http://projects.mcah.columbia.edu/ma/2018/. “Looking East” focuses on a portrait of J. J. Morier (ca. 1780-1849) wearing Qajar-era Persian clothing, his illustrated travelogues to Persia (published in 1812 and 1818), and his 1824 picaresque novel The Adventures of Hajji Baba of Ispahan, all considered from the perspective of Morier’s own documentary eye, and post-colonial readings of Orientalism today. The exhibition includes material from Art Properties, the Rare Book and Manuscript Library, and Burke Library. Conservation work on the books and their cradles were prepared by the Columbia Libraries Conservation Lab. Complementing the exhibition is a display of Iranian ceramics from the 10th to 19th centuries from the Art Properties collection, and an illustrated copy of Pascal-Xavier Coste’s Monuments modernes de la Perse (Paris, 1867) from Avery Classics. The exhibition is open to the public Monday to Friday, 9:00am to 5:00pm until December 14, 2018. Attributed to George Henry Harlow, Portrait of James Justinian Morier (ca.1780-1849), 1818, oil on canvas, 28 x 24 in., Art Properties, Avery Library, Columbia University, Gift of Dr. Calvin H. Plimpton and his mother Anne Hastings Plimpton, to the George A. Plimpton Collection (2000.6.32). This entry was posted in Uncategorized on September 26, 2018 by Carole Ann. Please join us to celebrate the launch of the Digital Serlio Project at a day-long symposium focused on current research on Sebastiano Serlio’s unpublished masterwork, On Domestic Architecture (Tutte l’opere d’architettura, Libro VI). 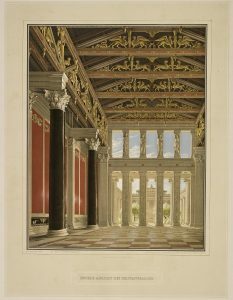 The Digital Serlio Project provides online access to Avery Architectural & Fine Arts Library’s unparalleled holdings of the works of Sebastiano Serlio (1474–1554). The Project brings together this corpus of newly digitized works with scholarly essays focused on the unpublished sixth book contributed by an international cohort of scholars and students. Sidney J. Weinberg, Jr. Foundation. Image credit: Detail of Plate XLVI, Sebastiano Serlio, VIII libro di Serlio : m.s. 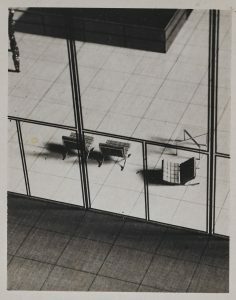 architettura, ca. 1550. This entry was posted in Avery Classics Collection, Lectures and tagged Symposium on September 19, 2018 by Carole Ann.